Cardiovascular disease (CVD) is the leading cause of deaths globally, with greatest premature mortality in the low- and middle-income countries (LMIC). Many of these countries, especially in sub-Saharan Africa, have significant budget constraints. The need for current evidence on which interventions offer good value for money to stem this CVD epidemic motivates this study. 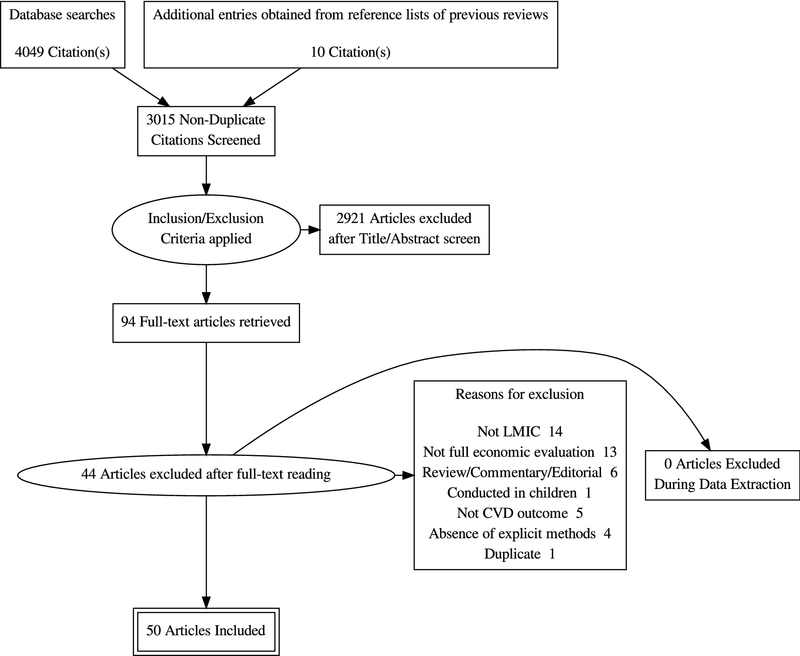 In this systematic review, we included studies reporting full economic evaluations of individual and population-based interventions (pharmacologic and non-pharmacologic), for primary and secondary prevention of CVD among adults in LMIC. Several medical (PubMed, EMBASE, SCOPUS, Web of Science) and economic (EconLit, NHS EED) databases and grey literature were searched. Screening of studies and data extraction was done independently by two reviewers. Drummond’s checklist and the National Institute for Health and Care Excellence quality rating scale were used in the quality appraisal for all studies used to inform this evidence synthesis. From a pool of 4059 records, 94 full texts were read and 50 studies, which met our inclusion criteria, were retained for our narrative synthesis. Most of the studies were from middle-income countries and predominantly of high quality. The majority were modelled evaluations, and there was significant heterogeneity in methods. Primary prevention studies dominated secondary prevention. Most of the economic evaluations were performed for pharmacological interventions focusing on blood pressure, cholesterol lowering and antiplatelet aggregants. The greatest majority were cost-effective. Compared to individual-based interventions, population-based interventions were few and mostly targeted reduction in sodium intake and tobacco control strategies. These were very cost-effective with many being cost-saving. This evidence synthesis provides a contemporary update on interventions that offer good value for money in LMICs. Population-based interventions especially those targeting reduction in salt intake and tobacco control are very cost-effective in LMICs with potential to generate economic gains that can be reinvested to improve health and/or other sectors. While this evidence is relevant for policy across these regions, decision makers should additionally take into account other multi-sectoral perspectives, including considerations in budget impact, fairness, affordability and implementation while setting priorities for resource allocation. Cardiovascular disease (CVD) is the number one cause of mortality globally, accounting for about 31% of worldwide deaths. Estimates from the Global Burden of Disease (GBD) 2015 study showed that there were 422 million cases of CVD globally, and deaths from CVD have increased from 12.6 million in 1990 to 17.9 million in 2015 . Over four-fifths of premature mortality (deaths before age 70 years) from non-communicable disease (NCD) occurs in low-income and middle-income countries (LMICs), and over a third is caused by CVD . While the trend (1990–2015) in age-standardized prevalence of CVD is declining in high-income countries (HIC), this is not very obvious for most LMICs, where current rates are > 9000 prevalent cases per 100,000 persons. Likewise, there have been significant declining trends in age-standardized CVD mortality rates in all HICs, however similar changes have not been observed for the majority of sub-Saharan Africa and Southeast Asia . The epidemiologic transition and demographic changes (population growth and ageing) have contributed to the CVD burden in LMICs. Evidence from research on early life (in utero) exposures, genes, and the environment have added to the understanding of the development and occurrence of CVDs in adulthood. Furthermore, metabolic (high blood pressure, high blood glucose, dyslipidemias, obesity) and behavioural (tobacco use, unhealthy diet, physical inactivity) risk factors are time-honored drivers fueling this CVD epidemic around the world . A number of these risk factors are modifiable, and are targeted to curtail this burden via preventive and or treatment strategies. There are several models of prevention, including population-wide and individual approaches targeting either individual risk factors, or multiple risk factors . These strategies may be geared towards individuals with risk factors to prevent incidence of CVD events like cerebrovascular accidents and ischaemic heart disease (primary prevention) or in those with CVD events to prevent recurrence (secondary prevention) or reduce long-term impairment and disability resulting from a CVD event (tertiary prevention) . Preventive interventions include (but are not limited to) medical procedures, pharmacological (blood pressure and cholesterol lowering medication, anti-platelet aggregants, thrombolytic agents) and non-pharmacological (health education, taxation, legislation) interventions. Recognizing the plethora of individual country healthcare needs, and ever limited resources, the requisite for economic evaluation of interventions has been increasingly acknowledged . This economic evidence forms one of the parameters for government and health policy makers as they decide on where to invest . While there is overwhelming evidence in HICs from economic evaluations on the cost-effectiveness of interventions for CVD prevention, this is not the case for LMICs. Moreover, the transferability and implementation of interventions trailed in HIC to LMICs is debatable . Among others, there are differences in effectiveness and cost related to variations in socio-cultural, environmental, demographic, disease profiles and importantly, human and financial resources. Especially in Africa, LMICs are not only faced with the growing NCD burden, but are also afflicted by still-large burdens of infectious disease, nutritional disorders, neonatal and maternal mortality . Thus, considering the inherent limited financial resources amidst these colossal health needs (communicable and non-communicable), their governments are faced with a greater challenge in choosing interventions that offer good value for money. Based on the above, there is great need for robust evidence on which interventions are cost-effective to inform policy decisions. We must acknowledge that this is not the first review on economic evaluations for CVD. Suhrcke et al. and Shroufi et al. have previously reviewed the topic, though their work included studies only up to 2009 and 2010, respectively. The study by Suhrcke and colleagues had a number of limitations. While they used a reasonably sensitive database search strategy, they did not assess grey literature and so it is likely that they might have missed some important studies. Also, their quality assessment was based on authors’ statements on methods, instead of objective quality assessment tools. Furthermore, it is unclear why the study by Shroufi et al. included few studies. However, we noticed that in terms of geography, they used continental or regional names in their search. Including specific country names would likely have increased the sensitivity of their search strategy in capturing more studies. Considering the time since the conduct of these studies and the above shortcomings, there is a clear need to provide updated and contemporary evidence of interventions providing the most health gains with minimal costs, in the prevention CVD in LMICs. This systematic review has been reported in accordance with the Preferred Reporting Items for Systematic Reviews and Meta-analyses (PRISMA) guidelines , (Additional file 1). Our review was registered in the PROSPERO International prospective register of systematic reviews (registration number: CRD42016043510) at the Centre for Reviews and Dissemination, University of York, UK and the protocol has been published . The objective of this study was to identify, via a comprehensive synthesis, those interventions that are cost-effective in the prevention of cardiovascular diseases in low-income and middle-income countries in order to inform and guide health policy in these countries in curbing the growing CVD burden. For inclusion in this review, studies had to be primary (observational studies and randomized control trials) or modelling studies reporting on interventions for primary or secondary prevention of CVD among adults (> 18 years) from LMICs. Only those reporting full economic evaluations (cost-effectiveness analysis (CEA), cost-utility analysis (CUA) or cost–benefit analysis (CBA)) with clear identification of comparators (either current practice or the ‘do nothing’ scenario) and outcome measures such as cost per life year gained or per unit clinical outcome, cost per quality adjusted life year (QALY) or cost per disability adjusted life year (DALY) were considered. All studies written in English or French were included. We excluded narrative reviews, letters to the editor, case series with sample size less than 50 participants, and others lacking explicit information on methods. We conducted a comprehensive search of several medical and economic literature databases from inception to 10 July 2017 (date of last search). Databases searched were: MEDLINE via PubMed, EMBASE, SCOPUS, Web of Science, EconLit (American Economic Association), NHS Economic Evaluation Database (NHS EED) and Database of Abstracts of Reviews of Effects (DARE) via Centre for Reviews and Dissemination (CRD) database. The WHO AFROLIB, African Journals Online (AJOL) and Africa Index Medicus were also searched for literature specific to Africa. Additional file 2 shows in detail the search strategy which was adapted for each of the searched databases. For grey literature, we searched websites of research organizations such as Disease Control Priorities (DCP) and WHO-CHOICE. We also searched Google Scholar and where necessary, corresponding authors were contacted via email. To further complement our database search, we perused the reference lists of the previous review studies and articles that met our inclusion criteria. Two reviewers independently screened titles/abstracts (LNA and BZ-D), independently screened full texts and extracted data (LNA and NTF) for studies included in the review. Any disagreements or conflicts were resolved by consensus or consultation with third reviewer (JLV). Using a preconceived data-extraction form, all relevant data was obtained including first author name and year of publication, study setting, geographic region, country income level (according to 2017 World Bank classification) , study design, intervention type and measure, intervention target, risk factor(s) examined, effect estimate (relative risk or effectiveness measure), type of economic evaluation, comparator, outcome, type of sensitivity analysis, economic perspective, incremental cost-effectiveness ratio (ICER), cost-effectiveness as described by authors and the criteria, funding sources. For modelling studies, the type of modelling strategy (micro- or macro-simulation), time horizon and discount rate were recorded while for primary studies, the specific study design, sample size of intervention and control groups, mean age of participants, percentage of male or female participants and length of follow-up data were obtained. The reporting and methodological quality of all included studies was independently assessed by two reviewers (LNA and NFT) using the Drummond checklist for economic evaluation studies . This checklist has 35 questions in total distributed under three major sections covering aspects of study design; sources and quality of data collected; data analysis and interpretation of results. These questions have Yes, No, Not clear and Not applicable as possible responses (see Additional file 3). We then used the NICE scale in rating quality, with ‘++’ for good quality, ‘+’ for moderate quality, and ‘−’ for poor quality studies denoting low, moderate and high risk of bias, respectively . The quality assessment was for overall study level and not the outcomes for included studies. Discrepancies in quality assessment were resolved by consensus. This has been previously described in the review protocol . Briefly, EndNote V.7.4 software was used for removal of duplicate records. The remaining studies uploaded into Rayyan QCRI , which is a web and mobile-app internet-based program that assists collaboration between reviewers through the screening and selection process. All data extracted from final included studies were entered to Microsoft Excel 2013 spreadsheet. Data synthesis involved stratifying and summarizing the evidence by preventive intervention type, appraising the economic evaluation methods used for assessing interventions and presentation of cost-effectiveness outcomes. Inter-rater reliability for study inclusion and quality assessment was assessed using Cohen’s kappa coefficient (k). All analyses were done using STATA v. 15 (STATA corp, Texas, USA). The database search yielded 4049 entries, and ten additional studies were obtained from the reference lists of prior reviews [7, 9] giving a total of 4059 studies. After removal of duplicates, 3016 studies were left. The titles and abstracts of these studies were screened independently by two reviewers (LNA and BZ-D) for relevance. After exclusion of clearly irrelevant articles, 94 potentially eligible articles remained which were then read in detail independently by two reviewers (LNA and NFT). Of these, 50 met our inclusion criteria. Data extraction and quality assessment was done by two independent reviewers (LNA and NFT). Inter-rater reliability (Kappa statistic) for study inclusion was high (k = 0.89). Figure 1 shows the PRISMA flow diagram of the study selection process. Included studies were published from the year 2000, with numbers progressively increasing (Fig. 2). Forty-four (88%) of these studies were from single countries, and six (12%) conducted for two or more countries. Most included studies were conducted for East Asia and the Pacific (n = 16, 32%), Latin America and the Caribbeans (n = 10, 20%), and sub-Saharan Africa (n = 8, 16%), six (12%) studies where from multiple regions. The majority of studies were conducted for upper middle (n = 31, 62%) and lower middle (n = 10, 20%) income countries. Only three studies were conducted in low-income countries [16–18]. In 22 (44%) studies, the main focus was primary prevention while 18 (36%) were on secondary prevention. Four were economic evaluations of hypertension or CVD screening [19–22]. The majority (n = 32, 64%) of studies were pharmacological interventions, followed by a mix of health education/promotion, legislative and medical procedure interventions. Most interventions targeted individuals (n = 38, 76%) with only seven for population-based interventions [20, 22–27], and five studies including both individual and population-based strategies [28–32]. Among CVD risk factors, twenty studies looked at interventions for single risk factors, on high blood pressure (BP) alone (n = 13, 38.2%), followed by high cholesterol (n = 3, 8.8%), atrial fibrillation (n = 2, 5.9%), salt (n = 1, 2.9%) and tobacco (n = 1, 2.9%). Fourteen (41.1%) studies assessed multiple risk factors including varied combinations of BP, cholesterol, smoking and salt intake; 13 of which assessed absolute CVD risk [16–18, 26, 28–36], with one comparing CVD risk in those with and without diabetes . Two (5.9%) studies were in persons with atrial fibrillation [37, 38]. Details of study characteristics are shown in Table 1. Compared benefits of administering polypill containing 3 antiHTNsive (thiazide, atenolol, Ramipril), a statin and aspirin to different high risk groups in Latin America compared to no polypill. Compare C-E of complete smoking ban versus partial smoking ban (India’s 2008 Prohibition of Smoking in Public Places Rules). Complete smoking ban = reduce smoking by 3.4% & exposure to SHS by 86%; Partial smoking ban = reduce exposure to SHS by 22% but no change on smoking prevalence. Half of the included studies were of high quality. Of the remaining studies, 21 (42%) classified as moderate quality and 4 (8%) as low quality. Details of the quality assessment can be found on Table 2 and Additional file 4. All but four studies evaluating legislative or health education interventions [24, 25, 33, 34], focused on pharmacological interventions. Most of them targeted individuals, with just two exclusive population-based [24, 25] and three targeting both individuals and populations [29, 31, 32]. Among studies that evaluated the cost-effectiveness of single anti-hypertensive drugs, diuretics were found to be the most cost-effective; for initiation as monotherapy , for use in high risk groups , and at various absolute CVD risk levels . Other BP-lowering medication had comparatively higher cost-effectiveness ratios or were cost-ineffective [16, 18, 35, 36] except for Candesartan, which was found to be cost-effective compared to other Angiotensin II receptor blockers in South Africa . In studies evaluating combination therapies, most were generally dominant or cost-effective in all tested  or some [18, 28, 31, 39, 40] absolute CVD risk thresholds, and in people with SBP > 160 mmHg . In people with diabetes, apart from ACE inhibitors and CCB combinations in low and moderate CVD risk individuals, other BP lowering drug combinations were not cost-effective in Tanzania . Three studies assessed cost-effectiveness of various BP treatment guidelines/strategies. In one, treatment based on the 10-year absolute CVD risk was cost effective, whereas treatments based on SBP levels of > 140 or > 160 mmHg were not cost-effective . A modelled evaluation compared three BP treatment strategies; treatment to target (TTT), benefit-based tailored treatment (BTT) and a hybrid strategy proposed by the WHO. The authors found that BTT was more cost-effective than TTT or the hybrid strategy . Gu et al. found that treatment of individuals with stage 2 hypertension only or those with either stage 1 or stage 2 using low cost anti-hypertensives were cost-effective . In a RCT comparing the impact of home health education alone, GP training alone, or the combination of both versus usual care in reducing SBP, the combination strategy was most cost-effective . Individual drug treatment with statins was found to be dominant at both LDL cholesterol thresholds of 160 and 190 mg/dL , highly cost-effective in Iranian men older than 44 years  and cost-effective at various CVD risk thresholds [17, 28, 31, 32]. In Vietnam, individual statin treatment for cholesterol levels > 5.7 mmol/L and > 6.2 mmol/L was cost-effective, though less attractive compared to other measures explored . At same cholesterol levels, statin treatment was not cost-effective in Kyrgyzstan . When statin was added to a combination of BP lowering medications, it was found to considerably increase ICERs in Thailand . In one study in Tanzania, individual statin treatment alone or in combination with BP-lowering medication and aspirin in all absolute CVD risk thresholds was not cost effective . At population level, mass media and health education interventions for reducing cholesterol were found to be cost-effective [29, 32]. Three studies evaluated treatment with the polypill in Latin American countries , Thailand  and Argentina . In the study among Latin Americans, the polypill consisted of a combination of three anti-hypertensives (thiazide 12.5 mg, atenolol 50 mg, ramipril 5 mg), statin (simvastatin 20 mg) and aspirin 100 mg administered once daily to high risk individuals compared to no polypill. It was found to be cost-effective in high risk women and for men aged ≥ 55 years . In Argentina, the polypill strategy comprised administering a combination of enalapril 10 mg, hydrochlorothiazide 25 mg, atorvastatin 10 mg and aspirin 100 mg to people at various absolute CVD risk levels. This was cost-effective in those with a 10 year CVD risk of ≥ 20% . Finally, in the Thai study, a theoretical polypill intervention was used which consisted of a statin in full dose and three anti-hypertensives (diuretic, calcium channel blocker and ACE inhibitor) in half standard doses versus a do nothing scenario. This intervention was cost-saving in all 10 year CVD risk threshold levels, surpassing combination with 3 individual anti-hypertensive drugs . As regards smoking control interventions, most studies explored population-based strategies, including mass media campaigns [26, 28, 29, 31], legislation for smoking bans [24, 28] and increased taxation [28, 30]. Implementing a complete smoking ban compared to a partial smoking ban was cost-saving in India , while all mass media campaigns against smoking and increased taxation for tobacco products were cost-effective [28–31]. However, in Mexico, smoking ban and clean indoor air laws were found not to be cost-effective . In the three studies that evaluated individual-level tobacco interventions, treatments with Bupropion  and nicotine replacement therapy [28, 31] were found not to be cost-effective. All interventions to reduce salt intake were population-based, and examined health education via mass media campaigns [23, 25, 26, 28, 29], reduction of sodium content in bread , or voluntary industry labelling of foods and mandatory reformulation [23, 25, 28, 30, 32]. All health education strategies were found to be cost-effective. The reduction of sodium content in bread was cost-saving; product reformulation and voluntary reduction were similarly cost-effective or cost-saving, especially when implemented in combination. Two studies assessed the use of oral anti-coagulants in adults with atrial fibrillation (AF) for primary prevention of stroke. In Thailand , three new oral anticoagulants (rivaroxaban, apixaban, and dabigatran) were compared with warfarin in adults aged 65 years and above with non-valvular AF while in China , rivaroxaban was compared with warfarin, aspirin, aspirin with clopidogrel and no prevention in adults with AF stratified into seven CHADS2 score categories. In both studies, the new oral anticoagulants were not cost-effective. Interventions here were predominantly pharmacological, covering single or combination therapies for blood pressure and cholesterol, anti-platelet aggregates, anti-coagulants and thrombolytic therapy in patients with CVD events (myocardial infarction (MI), stroke, heart failure). One study investigated the cost-effectiveness of influenza vaccination in those with ischaemic heart disease. The rest of the studies focused on medical procedures (stents, implantable cardioverter defibrillators (ICD), percutaneous coronary interventions (PCI)). Among studies that evaluated treatment with blood pressure lowering medication only, ACE inhibitors  and diuretics  were found to be cost-effective or cost-saving . However, other single treatment interventions with beta-blockers and statins were not cost-effective [18, 28, 30]. One study assessed the addition of n-3 polyunsaturated fatty acids to standard therapy in post MI patients for secondary CVD prevention and mortality, and it was not cost-effective . Combination therapies with a range of BP lowering drugs, statin and aspirin were found to be cost-effective in preventing recurrent stroke events, MI or both [18, 40, 51]. However, Tolla and colleagues found that in Tanzania, some selected combinations of BP and cholesterol lowering drugs with aspirin were not cost-effective . Five studies specifically evaluated the cost-effectiveness of antiplatelet drugs. Two of them showed that clopidogrel alone  and clopidogrel with aspirin  were more cost-effective than aspirin alone. In one study, clopidogrel for secondary prevention of stroke was cost-ineffective . Ticagrelor was also more cost-effective than clopidogrel in patients with acute coronary syndromes in preventing future stroke or MI . In acute coronary syndrome patients undergoing percutaneous interventions, prasugrel was cost-effective in reducing risk of mortality, stroke and MI . Seven studies evaluated interventions with anticoagulant or thrombolytic therapies. Tissue plasminogen activator was found to be cost-effective, when used within 6 h of ischemic stroke  and when compared to Streptokinase . In one study, prehospital thrombolysis was found to be cost-effective compared to in-hospital use . Streptokinase was moderately cost-effective when used in combination with other BP medication [18, 51], but not cost-effective when used alone . In one study, fondaparinux was found to be cost-saving compared to enoxaparin in patients with non-ST segment elevated MI (NSTEMI) acute coronary syndrome . Four studies evaluated procedures including, PCI , stents [60, 61] and ICD . For stents, drug-eluting early generation and new generation stents were cost-effective compared to bare metal stents . In Brazil, though stents were not cost-effective in preventing CVD events, a sensitivity analysis showed favourable ICERs in patients with diabetes and for small vessels needing revascularization . Compared to standard heart failure (HF) therapy, ICD use in those aged 60 years with HF was not cost-effective in Brazil . In China, PCI was not cost-effective in high-risk patients with NSTEMI acute MI . Three studies evaluated hypertension-screening strategies for population-based interventions [20, 22] and individual/high risk individuals . In Nigeria, two strategies were compared to no screening; strategy 1 entailed hypertension screening and treatment for those with stage 1 hypertension (SBP = 140–159 mmHg and/or DBP = 90–99 mmHg) combined with 10-year CVD risk < 20% or stage 2 hypertension (SBP ≥ 160 mmHg and/or DBP ≥ 100 mmHg) with any CVD risk level. Strategy 2 entailed screening and treatment of all hypertensive people with CVD risk > 20%. The second strategy was found to be cost-effective while strategy 1 was only moderately cost-effective with a tendency to be dominated . In Vietnam, four screening scenarios (one-off screening, annual screening, screening every 2 years and screening in combination with increased treatment coverage) were modelled. All scenarios were cost-effective for men. However, for women two-yearly screening and screening at 35 years were not cost-effective . Gaziano et al. evaluated paper-based and mobile app based CVD screening by community health workers compared to standard care (opportunistic screening). The mobile app was cost effective in Mexico and Guatemala and cost-saving in South Africa . One study in India evaluated the cost-effectiveness of general practitioners doing pre-hospital electrocardiograph (ECG) in patients with chest pain for diagnosis of acute coronary syndrome prior to referral, compared to no ECG. They found that this was a very cost-effective strategy estimated at US$13 per QALY gained . Table 3 summarizes the methods used in the included studies. Overall, cost-utility analysis was most frequently used (n = 29, 58%), followed by cost-effectiveness analysis (n = 14, 28%). Six studies used both CUA and CEA [37, 45, 50, 52, 62, 63]. There was only one cost–benefit analysis . Overall, among the 20 studies which did CEA, life years gained/saved was the predominant benefit measure [23–25, 41, 44, 45, 49, 50, 52, 57, 58, 62, 63], while the rest of the studies either used drop in blood pressure [33, 34, 37, 39], avoided CVD [24, 44, 61] or restenosis  event as benefit measure. Out of 38 studies that mentioned their approach to defining an intervention as cost-effective or not, 7 employed the willingness to pay threshold, while the majority (n = 31) used the WHO’s Commission on Macroeconomics and Health (CMH) threshold using the respective countries’ GDP per capita. Overall, 43 studies were modelled economic evaluations, while seven were empirical studies with three economic evaluations conducted with randomized trials [33, 34, 39] and four alongside observational studies [27, 56, 57, 61]. For the modelling studies, the majority used a macrosimulation approach, mostly Markov models, with three incorporating decision trees [20, 59, 60]. Among the five studies that used microsimulations, two specifically used discrete-event simulation [52, 64] while the others [19, 42, 48] did not state the technique used. With respect to study time horizon, 27 studies evaluated interventions over the lifetime of the study population. Six studies did not state the time horizon [27, 33, 34, 39, 56, 61] while the remaining studies (n = 17) varied from one to 30 years. The majority of studies used a healthcare perspective. A societal perspective was used in 12 studies; however in eight, there was no estimation of productivity loss [17, 21, 24, 30, 40, 47, 51, 64]. Two studies used the third party payer perspective [35, 36], one used the patient perspective  and two did not state their perspective [26, 32]. As regards discounting, 40 out of the 50 used discounting for cost and outcomes, most (n = 37) used 3% as their discounting factor. Two of them used 5% [33, 35] and one used 7% . Uncertainty analysis was performed in 40 studies, with the majority doing deterministic (one-way) and probabilistic sensitivity analysis. Ten studies did not state or incorporate any uncertainty around their ICER estimates [23, 24, 26, 27, 30, 37, 39, 44, 49, 58]. In all, 34 studies received some form of funding, including four cases that were funded by pharmaceutical companies [37, 52, 59, 60]. Seven studies did not receive funding while nine did not mention any funding details. The evidence on cost-effectiveness of interventions for CVD prevention is growing rapidly, with the majority of studies being modelled economic evaluations in the middle-income countries. Primary prevention studies outnumbered those for secondary prevention. Most economic evaluations were for pharmacological interventions focusing on blood pressure, cholesterol lowering and antiplatelet aggregants. BP lowering interventions (mostly diuretics and its combinations) were cost-effective, especially in high risk populations. While some cholesterol lowering interventions alone were not cost-effective, treatment interventions based on absolute CVD risk were mostly cost-effective, with the polypill being most economically attractive. Population-based interventions were few and mostly targeted reduction in sodium intake and tobacco control strategies, and were usually cost-saving. 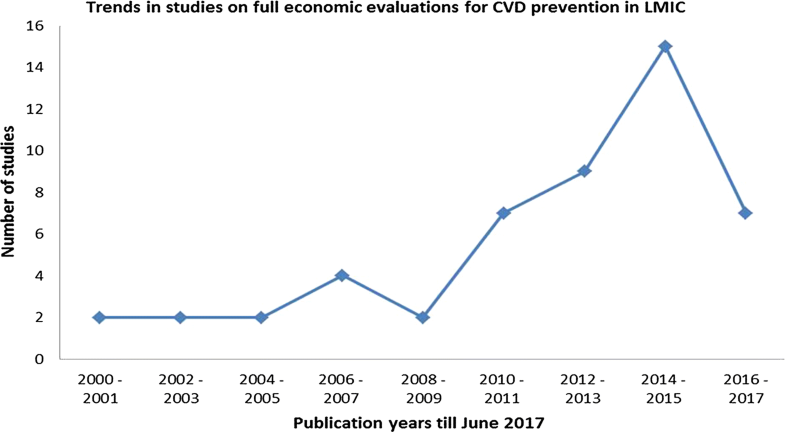 We observed that the number of publications on economic evaluations for CVD prevention have steadily increased, especially during the last decade. This coincides with, and might arguably be thanks to, the efforts of the Disease Control Priorities Project (DCP2) in 2006, which explored among others the cost-effectiveness of various interventions to combat NCDs. Additionally, the earlier publication of the WHO guide to cost-effectiveness analysis in 2003 , and availability of WHO-CHOICE methods  are likely catalysts for this observed surge in publications. For primary prevention, the majority are pharmacological interventions and target high blood pressure, high cholesterol and antiplatelet therapy either singly or in combination. Individual strategies focusing on BP lowering therapies have shown that compared to other antihypertensive drug classes, diuretics are consistently the most cost-effective as monotherapy. Other classes like beta-blockers, ACE inhibitors and calcium channel blockers tend to be favourable mostly when used in combination. Individual treatments with statins are cost-effective in some settings and are not in others, in part due to the different statin drugs evaluated with differing prices across countries. Studies that have evaluated the hypothetical polypill show that it is a very cost-effective option. However, controversy still looms as regards large scale implementation especially in relation to consequences/side-effects of mass treatments and stretching of limited budgets in LMICs . Secondary prevention strategies are similarly geared towards pharmacological strategies, and besides blood pressure and cholesterol lowering interventions; there has also been some focus on thrombolysis and medical procedures. Pharmacological interventions are mostly cost-effective, though with some specifics worth considering. Population-based interventions are relatively few but are cost-effective and or cost-saving. Differences in demographics and epidemiology, modelling assumptions, intervention costs and effectiveness across settings, economic perspectives and time horizons for which interventions are assessed and variation in compliance levels, likely account for the dissimilar conclusions across studies. Other individual strategies to control smoking like treatments with Bupropion and nicotine replacement therapy are not cost-effective options in the LMICs, although some reports from HICs have shown promise . Population-based interventions have mostly focused on reduction in salt (sodium) intake and smoking. These appear to be the most attractive population-wide interventions, being either very cost-effective or cost-saving in CVD prevention. In a recent systematic review, Hope and colleagues  summarized the evidence on economic evaluations of population-based sodium reduction interventions. Similar to our findings, they highlighted that salt reduction interventions offer good value for money. However, similar to ours, they noted that there are few studies assessing the impact of salt tax legislation . Most of the salt reduction interventions focused on health education via mass media campaigns, product reformulation and relabeling. With respect to tobacco smoking control strategies, contrary to a previous review  that suggested majority of interventions focused on nicotine replacement therapy (NRT) and self-help therapies, we found that mass media campaigns, increasing taxes and smoke-free laws were the predominant interventions studied. It is likely that the search strategy and comparatively limited number of databases searched in the prior review, coupled with a focus on high-income countries, might explain the difference. It should be noted, however that we found no economic evaluations of school-based cessation programs, smoking quitlines and tobacco control programs in pregnant women, which have been shown to be cost-effective and potentially cost-saving elsewhere [68–70]. The absence of such economic evidence might be due to the non-existence of such programs or studies evaluating them in LMICs. This constitutes a gap in the strategies to tackle the tobacco epidemic. With respect to medical procedures, we found very few studies have assessed their cost-effectiveness in LMICs, with the available studies mostly done in Latin American countries. In Brazil for example, early and new generation stents were considered cost-effective, though with limited benefit for moving from early to the new generation stents. Considering the limited available evidence here and the fact that many other regions have not evaluated the use of stents and ICDs, it is difficult to draw reasonable conclusions. However, on a case by case basis, clinicians will be required to strike a balance between long term clinical efficacy and costs to patients and health system. Screening strategies have been less well explored compared to other interventions. The few existing studies suggest that some strategies are potentially cost-effective. In a bid to enhance their economic attractiveness, their implementation must be stratified for specific population age groups and gender, as well as tailored to account for countries’ specific needs. As observed in previous reviews [7, 9], there are still few economic evaluations of interventions targeting other risk factors like physical activity, alcohol consumption and body mass. These are established drivers for CVD, and it is important that future studies should consider evaluating interventions targeting those drivers, so as to provide broad perspectives for consideration in stemming the CVD burden. The majority of included studies are modelled evaluations, with the majority using Markov modelling. This modelling approach has been widely discussed to be suited in modelling chronic diseases such as cardiovascular disease . While model-based evaluations might not be same as real life situations, they are increasingly gaining place in economic evaluation, for a number of reasons. Firstly, economic evaluations conducted alongside RCTs are likely to be limited in time horizon as it is costly for trials to extend for several years . Secondly, the majority of RCTs have intermediate endpoints (such as change in BP or change in cholesterol) as their outcome and very few extend to final end points (CVD event or death, let alone QALYs or DALYs). As such, these are unlikely to reveal the complete picture of costs and benefits of an intervention. Model-based evaluations have the potential to address these problems by using long time horizons . This is particularly seen for smoking-related interventions whose benefits generally accrue in the fourth or fifth decades following implementation of the intervention . Contrary to previous reviews, which found no cost–benefit analysis, we found a single study using this evaluation method. While there is clearly a dearth in studies using this method for evaluation, cost–benefit analyses are likely to be also relevant to policy makers as it allows for direct comparison of health interventions with interventions in other sectors . Up to one-fifth of included studies either did not assess, or failed to incorporate, uncertainty around their ICER estimates. This is particular, as most of the parameters used in modelling studies come from multiple sources, from contexts that differ from those of the target population. It is important to determine the uncertainty around the benefits and costs, and how this affects the ICER estimates. The uncertainty around the cost-effectiveness of interventions is important for policy makers, as they broadly assess and compare the potential gains or losses from implementing one intervention over another . About two-thirds of included studies received some form of funding, mostly from government ministries and universities or educational institutes. We noted that four studies were funded by pharmaceutical industries. Lundh and colleagues in a Cochrane review discussed the impacts of industry funding on research outcomes, in which they highlight that most industry-funded trials are likely to report drugs as efficacious or less harmful . This bias is similarly likely to occur in economic evaluation studies, with such [industry-funded] studies likely to report an intervention or drug as being cost-effective. It is difficult to say with certainty the accuracy of conclusions drawn from the four studies in our review which received pharmaceutical industry funding; with two having low risk of bias [52, 59] and two of moderate risk [37, 60]. It is possible that eliminating these studies, especially those with moderate risk may potentially influence some of our conclusions. We again highlight that interpretation of such findings should be done with caution. As regards methods for defining an intervention as cost-effective or not, the majority of studies used the WHO Commission on Macroeconomics and Health approach of multiples of GDP per capita, and only very few used a priori willingness-to-pay thresholds. While the proposed WHO method is good at determining those interventions that have good or very good value for money, Bertram and colleagues recently argued about the misuse of these thresholds for decision-making . Modelled cost-effectiveness ratios are amongst others dependent on the construct and validity of the models, variable sources of input parameters; they suggest that for priority setting, decision makers should, besides cost-effectiveness thresholds, take into account other factors such as budget impact, affordability, feasibility of implementation and fairness . Similarly, Remme and co-workers have recently proposed a multi-sectoral perspective for resource allocation, arguing that multiple sectors potentially contribute to health gain and that the goods and services obtained from health sector or interventions can have multiple benefits outside health . In a number of LMICs, Health Technology Assessment (HTA) is currently being considered to guide policy makers in priority setting for the allocation of scarce resources. Over the last decade, NICE International and Thailand’s Health Intervention and Technology Assessment Program (HITAP) agreed to create partnerships to improve priority setting in LMICs for HTA. Their efforts are well underway in Latin American and Asian countries like Colombia, Vietnam, India, Myanmar and the Philippines . In Africa, some strides have been made in countries like Ghana and South Africa, however, there are still huge gaps including absence of dedicated HTA institutions and limited research capacity [79, 80]. While countries, especially those that have adopted universal health care (UHC) are pushing for HTA to assist them allocate resources appropriately and equitably, as they sustain the UHC programs, studies have suggested that local evidence to inform HTA is limited , and further widens the gap between research and policy which is already challenged by low awareness and lack of will among policymakers in the region. We believe our efforts in this review will be very beneficial for policymakers in two facets. First, to feed countries with existing HTA institutions with comprehensive local evidence on interventions that have good value for money as they identify where to invest and guide their HTA efforts. Secondly, our findings will contribute in narrowing the existing knowledge gap on cost-effectiveness on CVD preventive interventions, while highlighting the importance of economic evaluations of interventions as an important guide to resource allocation and priority setting in LMICs with already strained financial resources. To bridge the existing knowledge and evidence gap on cost-effectiveness research, and by extension improve the health of populations via provision of cost-effective preventive interventions, experts at the MOH and policy makers should consider; (i) research and capacity building and (ii) the creation of a conducive and enabling environment for the generation of local quality research to inform decisions. Building research capacity, that is, creation of institutions for economic evaluation and improving technical capacity of local staff via training and workshops will empower local researchers with the skills necessary to generate more local and context-specific evidence to inform policy and decision-making on cost-effective strategies for disease prevention. Encouraging and facilitating partnerships and collaboration between other governments, organizations and researchers within and without the countries are other avenues for capacity building. Policymakers in the first instance need to develop the political will and interest in cost-effectiveness research and acknowledge its contribution to priority-setting and resource allocation. By so doing, they are likely to more easily understand the funding needs of researchers and organizations, for the generation of the much needed high-quality local evidence. This is particularly important as we note in our review that the evidence-base from LMICs especially the low-income countries is scant. Decisions based on evidence generated from HICs are unlikely to adequately address the needs of these populations due to differences in demographics, intervention effectiveness, variation in healthcare costs and standards of living, cultural differences all likely to affect acceptability, implementation and affordability of interventions. Taken together, there is a compelling need to link research and policy by improving the interaction between researchers and policymakers via policy meetings, dedicated sessions at conferences where policy makers meet with researchers to discuss evidence, opinions and thus creating opportunities for researchers and their findings to be more actively involved in policy decisions. In terms of future research, we note that majority (over two-thirds) of studies have focused on pharmacological interventions. Upcoming endeavours should consider looking into non-pharmacological (behavioural and lifestyle) interventions. Secondly, there has been a focus on individual level interventions. Further research on population-level interventions especially those targeting risk factors like salt intake and smoking, and legislative interventions which have in most cases been shown to be very cost-effective and cost-saving are potential areas for focus. For risk factors, most studies have focused on blood pressure, cholesterol, and smoking. We found almost no studies on economic evaluations for reduction in alcohol consumption, physical inactivity, consumption of fruits and vegetables and weight control interventions. These risk factors carry significant burden in LMICs , and the limited available interventions for their control highlight important caveats in the literature from the LMICs that need to be explored in future research efforts. Finally, we believe there is need for further work in harmonization and transparence in research analytical methods especially for modelled economic evaluations, as drawing conclusions from such synthesis efforts from studies with largely heterogeneous methods requires a high degree of caution in interpretation of findings, as well as consideration towards transferability and implementation in other settings. This systematic review has some limitations that should be discussed. First, limiting our search to only articles in English and French, we might have potentially missed articles in other languages. We however developed a detailed and comprehensive search strategy, accessed multiple databases and grey literature which hopefully should have minimized our missing potential studies. Secondly, a meta-analysis was not done. This is however not surprising for systematic reviews of economic evaluations, owing to the significant heterogeneity in applied methodologies, resources used and evidence on intervention effectiveness. It is important to note that the role of systematic reviews of economic evidence is not just to generate a single summary answer as is generally with systematic reviews of RCTs . The focus here is rather to provide policy/decision makers, clinicians, and stakeholders with information on the variety and quality of available evidence on cost-effectiveness of given interventions, relevant choices and or trade-offs they are likely to contend with, to identify gaps in the literature, and hopefully provide an understanding of the contexts and conditions under which interventions may be cost-effective . Finally, among studies included, 50% were of high quality and further 40% being moderate quality. On the whole, we can therefore have a fair degree of confidence in our findings. This systematic review has provided contemporary evidence on the interventions that offer good value for money for the prevention of CVD in LMICs. The bulk of studies focused on pharmacological and other individual-level interventions, which often were found to be cost-effective. Population strategies, though under-represented in the evidence base, are similarly very attractive economically. The available evidence suggests that stemming the CVD epidemic in LMICs would require both individual and population-based strategies to achieve maximal health gains at lowest possible costs. Additionally, there is need for a focus on interventions to address other risk factors like physical inactivity, low fruits and vegetable consumption, alcohol intake and body mass. Decision makers must however not rely exclusively on cost-effectiveness thresholds, but take into account multi-sectoral approaches, and other country and context-specific factors as budget impact, affordability, fairness and implementation as they contemplate which interventions to invest in. Finally, governments in LMICs need to strongly consider strengthening and building research capacity on economic evaluations of interventions, health technology assessment, as well as bridging the gap between research and policy in order to make informed decisions for priority setting towards the allocation of their scarce resources. LNA and JLV conceived and designed the study. LNA did the database searches, screening and data extraction. NFT and BZ-D contributed to screening and data extraction. LNA wrote the first draft, and all authors provided critical revisions and approved the final manuscript for submission. All authors read and approved the final manuscript. The authors are grateful to the University of Queensland for access to library services during the review process. All data necessary for interpretation of this study are contained in the manuscript and additional files. Additional information could also be found in the protocol in PROSPERO (https://www.crd.york.ac.uk/PROSPERO/display_record.php?RecordID=43510). This was a systematic review of published studies, hence ethical approval was not necessary. There was no funding support for this research. 12962_2018_108_MOESM1_ESM.doc Additional file 1. PRISMA checklist. 12962_2018_108_MOESM2_ESM.docx Additional file 2. Detailed search strategy. 12962_2018_108_MOESM3_ESM.docx Additional file 3. Drummond quality assessment checklist. 12962_2018_108_MOESM4_ESM.docx Additional file 4. Detailed quality assessment of studies. World Health Organization (WHO). Cardiovascular diseases (CVDs): fact sheet 2017. http://www.who.int/mediacentre/factsheets/fs317/en/. Accessed 18 Sept 2017. World Health Organization (WHO). Prevention of cardiovascular disease: guideline for assessment and management of cardiovascular risk 2007. http://www.who.int/cardiovascular_diseases/publications/Prevention_of_Cardiovascular_Disease/en/. Accessed 18 Sept 2017. The World Bank. World bank country and lending groups: country classification 2017. https://datahelpdesk.worldbank.org/knowledgebase/articles/906519-world-bank-country-and-lending-groups. Accessed 18 Sept 2017. National Institute for Health and Care Excellence (NICE). Methods for the development of NICE public health guidance (third edition) 2012. https://www.nice.org.uk/process/pmg4/chapter/reviewing-the-scientific-evidence. Accessed 18 Sept 2017. World Health Organization (WHO). CHOosing Interventions that are Cost Effective (WHO-CHOICE): WHO-CHOICE methods 2017. http://www.who.int/choice/cost-effectiveness/methods/en/. Accessed 18 Sept 2017.